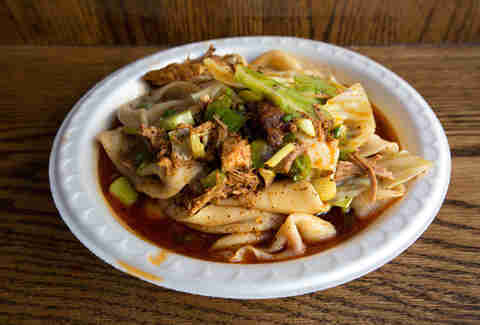 "I keep thinking about that noodle," a friend said to me, days after I first introduced him to Xi’an Famous Foods. "I don’t think a noodle has ever done that to me before." The menu at Xi’an (pronounced she-ahn) Famous Foods has both range and depth, boasting more than 30 items, including soups, burgers, and salads -- but what you really come here for is the noodles. Made fresh and hand-pulled before your very eyes, the noodles are up to 4ft long, thick as a belt, and covered with Xi’an Famous Foods’ house sauces -- a fragrant mix of soy sauce, garlic, vinegar, and chili oil. Not, in other words, for the dainty eater. Famous Foods serves Western Chinese street food, after all, and opened its first location in a subterranean food court in Flushing, Queens. When Famous Foods recently opened its 10th location (on Kenmare St in Nolita) within walking distance of the Thrillist office, I was determined to eat single every item on the menu. If you’re like me, you’ve got your regular order -- mine, over the years, has been beef or lamb noodles, lamb dumplings in soup, and cucumber salad -- but I wanted to get to know the rest of the menu, beyond my usual. And after dozens of trips over the course of a couple months, I think I have it sorted out. 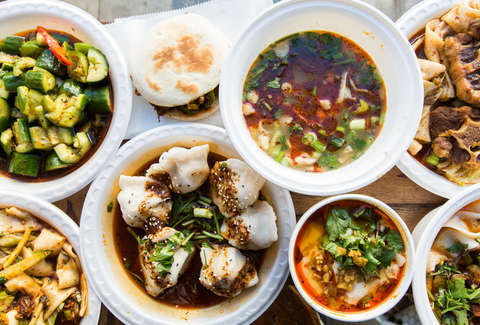 Here’s everything on the Xi’an Famous Foods menu, ranked. Next time you go, try something new. 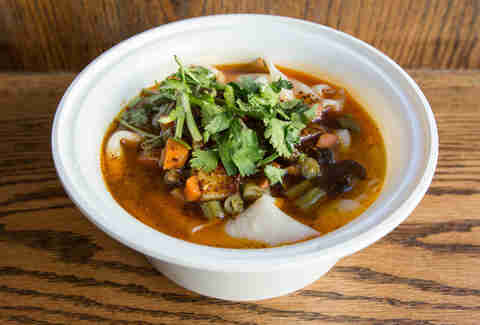 This soup offers the rare opportunity to eat lamb offal -- specifically tripe, liver, and lung -- in a bone broth with mung bean vermicelli noodles. Though if you want to experience the wonders of offal, I’d sooner recommend the offal skewers offered at Xi’an Famous Foods' flagship sit-down restaurant, Biang! in the East Village. Same as the Lamb Offal Soup, except sub kind-of-dry sliced lamb discs for offal. This is the option if you’re vegetarian and gluten-free, since this is the only noodle dish that checks both boxes. If you're not vegetarian and gluten-free, greater delights await you. This cubed pork runs on the dry side, and can be fatty, without great texture (though the noodles are still great!). Look for other noodle options. Here's what you want to think about if you're wondering whether to get your noodles in soup or not... is it a cold day? You might want the soup. Are you taking your noodles to-go? You definitely want the soup. 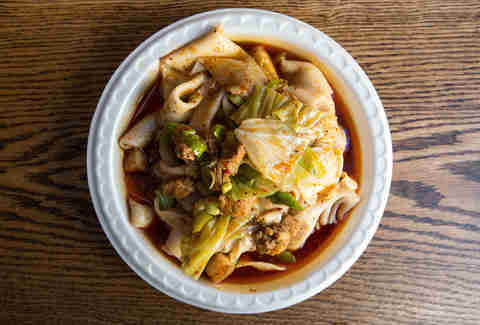 As signs posted in every Xi'an Famous Foods store will tell you, the noodles are best eaten immediately; they lose heat quickly, and their ideal texture along with it. But the best way to get away with not eating these noodles right away is to get them in soup, which retains the heat better and keeps the noodles closer to their ideal form, for as long as possible. It's impressive how much spinach is crammed into these dumplings. So much, however, that you don't get much of the spicy and sour sauce flavor. Mostly just spinach. Not gonna make much difference whether you get these in soup or not -- though fear not, vegetarians, it's a vegetarian broth! In fact, the broth is actually the same water that the noodles are cooked in. 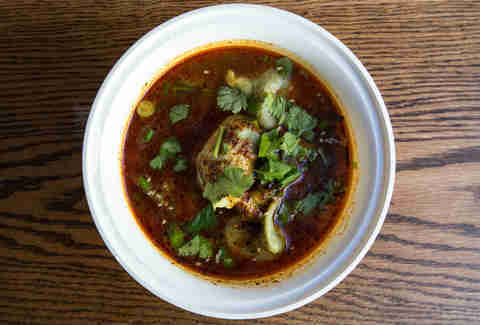 Which may sound a tad bland -- and you probably wouldn't want to sip it naked, on its own, but combined with all the spices and seasoning that top the dumplings, this broth is just fine. This dessert option currently on special is a nice, delicate capper on a meal. 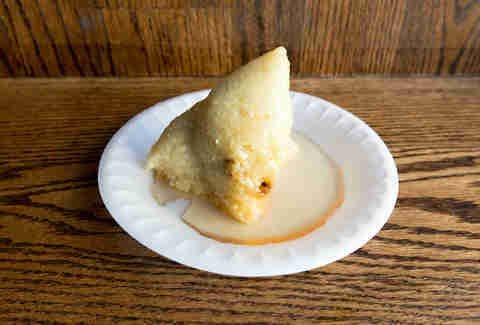 The sticky, mildly sweet glob of rice is filled with dates and juju beans and served at room temp. A lotus leaf wrapping (removed before serving) makes it taste like a chewy cup of tea. This burger consists of just shredded pork on a bun, without any sauce or garnish, so it’s dry for a burger -- but that also makes it pretty tidy as an on-the-go food. And you’re paying less than $4, so you can’t beat the price. It's amazing what different flavors come out in the cold skin noodles when they come stir fried (order A2) versus when they don't (order A1). The stir-fried noodles are served hot and are thus more satisfying and fitting as a main order, but they're better-appreciated cold, which is how they are meant to be eaten. This bone-in dark-meat chicken tastes pretty... chickeny. There are better meat options, even among the white meats. 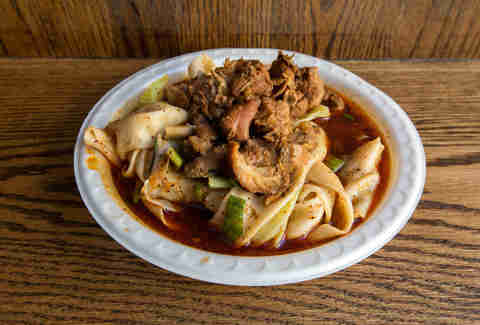 A very traditional soup from the Chinese city of Xi'an, this is the same sliced lamb and vermicelli noodles from the lamb soup above, with the addition of cubed pieces of bread (which come from the burger buns). 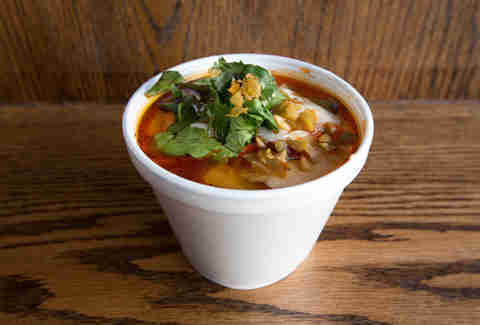 The bread softens in the soup but still holds its form, and makes a perfect conduit for the broth. This is the best way to appreciate the hand-ripped noodles for their own merits, with no meats or sauces to distract. And boy are they good. The shredded, stewed pork varies greatly from bite to bite... too dry in one taste, flavorful and succulent in the next. 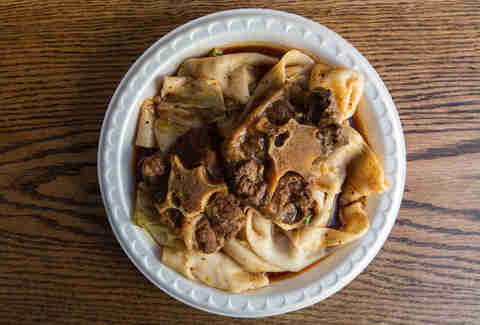 The dry pieces are almost worth dealing with, or picking around, to get to the rest of the perfectly tender pieces, which steep in a lightly spicy sauce containing its own pork juices. A great compliment to the noodles. The soup is a welcome addition because it can add some forgiving moisture to the pork, which can occasionally be dry. But then the spices and juices from the pork itself become a bit diluted into the broth, so you win some you lose some. This cold, crunchy, refreshing dish is best eaten as a side, and comes with sliced cucumber, cilantro, sprouts, and a nice spongy seitan that soaks up the sauce well. The actual noodles go down easy, but don't make a mistake of thinking you're getting the hand-ripped noodles. I don't even like tofu, and even I can see why tofu-lovers find this so addictive. The sauce is spicier than most dishes, which seems to be a theme for the vegetarian side of the menu, and the tofu is melt-in-your-mouth soft. Served in a cup, this is a good, inexpensive side item. The Tiger salad is a pleasantly simple mound of greens, consisting mostly of chopped cilantro and shaved celery, plus the chopped whites of green onions, and dressed with vinegar and sesame oil. It's a fresh, bright counterpoint to have as you eat most anything else on the menu, and an especially good choice as a refreshing palate cleanser if you can't handle much spice. An employee favorite, the oxtail is super tender, if a little awkward to eat with chopsticks. If you're an oxtail fan, this is a great rendition. And if you've never tried it, this is a good place on the menu to get adventurous. Besides the previously noted benefits to the noodles' longevity, the soup doesn't fundamentally change anything here. The Mt. Qi noodles win the award for best vegetarian main item on the menu. The exact vegetables can differ from day-to-day, put expect to see some combo of carrots, potato, jicama, mushrooms, green beans, bell peppers, seitan, or even chickpeas. Regardless of the mix, the texture of the vegetables is near-perfect. The sauce is one of the spicier ones on the menu, but it’s well-balanced and not scorching. Soup or no soup, there's not much advantage one way or the other on this one except, again, that the noodles hold up better in the hot broth if you're taking them to go. This spicy, refreshing salad is the perfect compliment between bites of the heavier, comforting items on the rest of the menu. 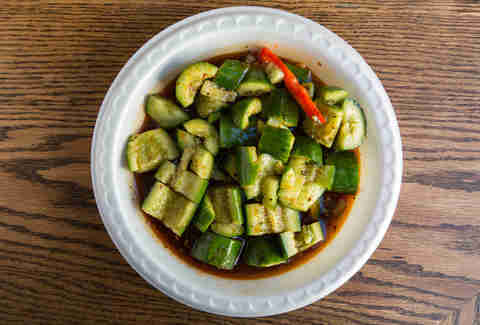 The cucumbers are fresh and crisp and come in the Xi'an FF classic sauce. If you're ordering with a friend, you should eat get your own noodles, and the cucumber salad to split. You could go years eating little else off the menu and be perfectly happy -- I know because I did it. Despite the name, this isn't overly spicy or tingly (order it hot if you want to up the ante), but you will get a bit of a tingling or numbing sensation coming from Sichuan peppercorns in the sauce. The tender chunks of beef hold up well in the broth, which makes this an ideal choice if you're looking for noodles in soup. The lamb burger has won accolades as some of the best Chinese Food in New York, and the best food in Chinatown under $5 -- and for good reason. Costing just $3.50-$4 depending on location, the lamb burger gives any slice of pizza or bacon-egg-and-cheese in NYC a run for its money as the best on-the-go food in the city. 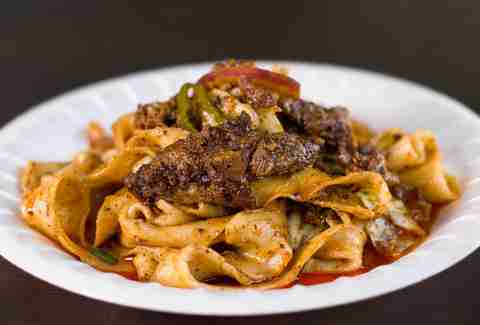 Aside from Xi'an FF's hand-ripped noodles, the spicy cumin lamb -- spiced lamb sautéed with red onion and hot peppers -- is the best thing Famous Foods has going for it. And in the burger you get it in all its glory (and in a hand-held, easy-to-eat flatbread sandwich, at that). If the hand-ripped noodles, and the spicy cumin lamb are the two best parts of the menu, then obviously the two of them together are as good as it gets... but more on that later. For now I'll just say that the lamb noodles are the one big exception to the "noodles in soup are slightly better" rule, because the soup allows the spices to dilute a bit into the broth, and the lamb is best with those spices clinging directly onto the meat. The Zha Jiang noodles were, by far, the biggest revelation to me on the menu. Dressed in a well-balanced, spicy and lightly sweet sauce with sliced cucumbers, scallions, and celery, the ground pork is far more tender than the Mt. Qi cubed pork, and takes holds onto the flavors of the sauce better than the stewed pork. If you've never strayed from the beef and lamb noodles, try this for sure. 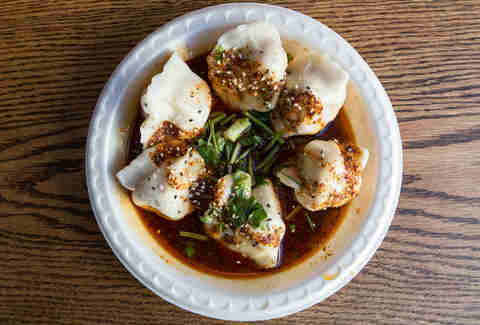 These dumplings are so good they have been responsible, single-handedly, for lifting my mood on multiple occasions. More sour than spicy, its impossible not to feel your spirits rise as the generously stuffed, delicate dumplings melt away in your mouth. Dumplings aren't available at every location, making them an even more special delicacy. You can't go wrong either way, but I give a slight nod to the lamb dumplings in soup. When eaten dry you can better appreciate the delicate texture of the noodle wrapping and the compliment of spices sprinkled atop, but letting the bone broth soak into the tender ground lamb is the best way to eat these. 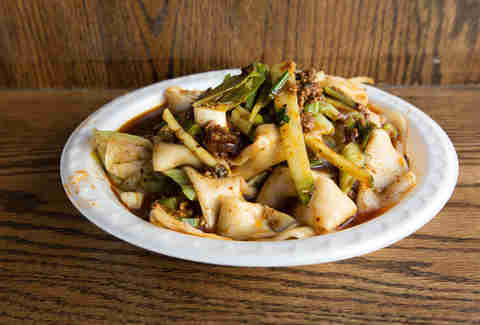 The most popular item on the menu and for good reason, this is the very best of everything Xi'an Famous Foods has to offer, and one of the 50 NYC foods you need to eat before you die. Unless you've eaten a lot of Northwestern Chinese food, which typically uses this balance of cumin and a bit of heat, you've probably never eaten anything quite like this -- or quite this good. Located along the Silk Road, the Chinese city of Xi'an had access to spices of the Middle East, including cumin, and was influenced by a sizable Muslim population. The cuisine persists today and finds a delicious and authentic embodiment in this dish, which is distinct from the more common Chinese cuisines found in America. The bits of spiced lamb are sautéed with red onion and hot peppers, for a spicy, aromatic mix that clings perfectly to the noodles. I've taken many NYC visitors on days-long eating tours across the five boroughs, and when it's all said and done they most often point back to one thing as the most memorable: these lamb noodles. Bison Messink is the Deputy Editor at Thrillist. 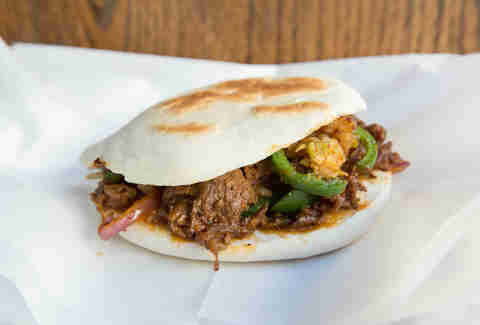 Meet him for lunch tomorrow at the Xi'an Famous Foods on Kenmare St. On Twitter @bisonmessink.